Before I took this shot, before they were transported from bridal suite to reception, I spent an hour with the bridal party. The bride’s getting her hair and make-up adjusted, the bridesmaids were tired because they were up since 6 am, the groomsmen were going through their emcee jokes / speeches. I was there because I had nowhere to go during the break, and thought I might as well document what they were doing behind the scenes. One of the groomsmen asked me what do I do in my spare time. I said I have a baby now I have no spare time – maybe cooking? And then we started talking about food. How Malaysians steal everything from Indonesia. And then Singaporeans stole everything from Malaysia. We started swapping restaurant recommendations. 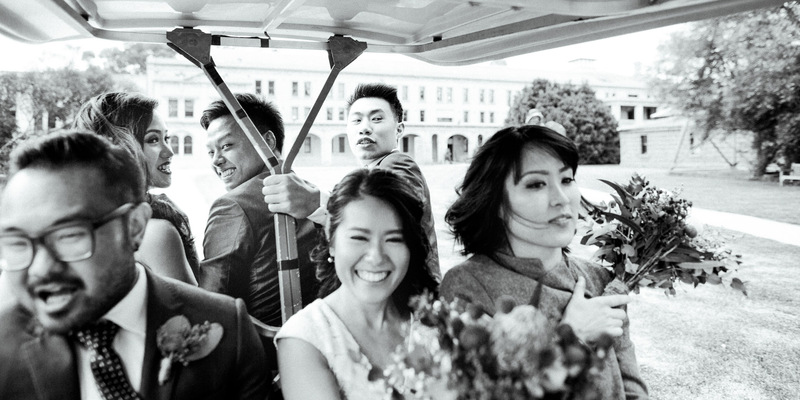 Nowadays it is quite rare to be able to pause and chat with the bridal party. Most of the time we don’t fully meet before the ceremony. I know I’m one of the many many vendors and suppliers they have to deal with on the day. I adore this photo because I feel like I captured everyone’s personalities. Maybe it’s because I felt like I knew them a little bit more? Or perhaps after spending some time together, they were more relaxed with me? Maybe, it’s just the golf buggy. Golf buggies bring the best out of everyone.